Mohandas Karamchand Gandhi (1869-1948) also known by the honorific title Mahatma Gandhi, was a great leader who obtained India's independence from Britain. Gandhi was pro-life, observing that "It seems to me clear as daylight that abortion would be a crime." It was his philosophy of Satyagraha or nonviolent non-compliance (being willing to suffer so that the opponent can realize the error of their ways)—which led India to independence, and has influenced social reformers around the world, including Martin Luther King, Jr. and the American civil rights movement, Steve Biko and other activists in anti-apartheid struggle in South Africa, and Aung San Suu Kyi in Myanmar. As an Indian lawyer on a one-year assignment in British South Africa, Gandhi experienced racism first-hand. He was thrown off a train at Pietermaritzburg for refusing to ride in the third-class compartment while holding a valid first-class ticket. Later, on the same journey, a stagecoach driver beat him for refusing to make room for a European passenger by standing on the footboard. He urged peaceful civil disobedience against the British, calling on Indians to refuse to pay taxes to Britain and refuse to attend British schools. He also called for a boycott of British manufactures, especially for the cloths that Indian weavers are so famous for. The Indians heeded Gandhi’s leadership and stopped buying British cloth. Gandhi also called for the Indian National Congress to change from an elite or wealthy group into more of a people’s voice that could advocate independence. Gandhi drew upon Christian concepts as well as his native Hinduism. His education included studying law at the University College London, though Gandhi makes little mention of that in his autobiography and details are unclear. One of Gandhi’s acts of protest was to lead the Salt March in 1930 for 240 miles to the sea, so that Indians could obtain salt from evaporated salt water rather than buy it from (and pay taxes to) Britain. A law required Indians to buy salt from the British government, but Gandhi’s march peacefully disobeyed that law and created much publicity. Gandhi and many of his supporters were eventually arrested for some of their protests. At one point a British leader agreed to meet with Gandhi, who then attended with the simple Hindu clothing of a single cloth gown. Offended by this, some British demanded an explanation. Gandhi responded that the British official, who was dressed in the customary suit and tie, was wearing enough clothes for both of them! Eventually Gandhi’s protest efforts paid off, as the British Parliament enacted the Government of India Act in 1935, which gave India some self-government and democratic elections, and ultimately India became completely independent in 1947. Muslims, however, feared majority Hindu rule and requested a separate state for Muslims. The Muslim League endorsed the creation of a new country called “Pakistan” for the predominantly Muslim population of that region. The British were forced in 1947 to partition India into two countries, India and Pakistan, in order to prevent civil war between the Muslims and Hindus. 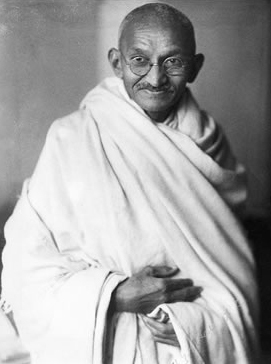 Gandhi was a vegetarian and would go on fasts for causes of peace. He was assassinated by Hindu ultra-nationalists on 20 January 1948, shortly after Indian independence. Gandhi's understanding of religion and Indian culture was the key to understanding his public life. While his religion was grounded in the Hindu beliefs he had been taught as a child, Gandhi fashioned for himself a humanist religious philosophy on which he based his theory of nonviolence as a political method as well as his economic theories. Gandhi was eclectic in seeking and using insights from other religions, especially Christian pacifism. He rejected the theology that the Christian gospel was the necessary path for all humankind to follow. Gandhi's mixed attitude toward Islam had more direct political consequence. He rejected Islamic claims of universal validity, but political realities led him in the 1920s to support the anti-British Khilafat movement, which was based on an appeal that Islam was in danger because of the British role in overthrowing the Ottoman Empire. Some historians argue that there were unintended consequences in his support for this pan-Islamic movement, because it brought religion into politics in a highly divisive way, leading to Partition of Pakistan as a separate nation in 1947. Nanda (2002) argues that Gandhi and the Indian National Congress did not see that their vision of nationhood was not shared by the Muslim leadership. Two incompatible nationalisms were contending for living space in the same territory. (When asked what he thought of Western civilization):"I think it would be a very good idea." (Later in his life when he was asked whether he was a Hindu, he replied:) :"Yes I am. I am also a Christian, a Muslim, a Buddhist and a Jew." Richard Attenborough's 1982 film, entitled simply Gandhi, won eight Academy Awards, including "best picture," as well as BAFTA and Golden Globe awards. It is a biographical film that stays close to the historical facts of Gandhi's life. Film critic Roger Ebert said that actor Ben Kingsley (half Indian and half English) "makes the role so completely his own that there is a genuine feeling that the spirit of Gandhi is on the screen." Nanda, B. R. In Search of Gandhi: Essays and Reflections. (2002). This page was last modified on 9 April 2019, at 12:46.